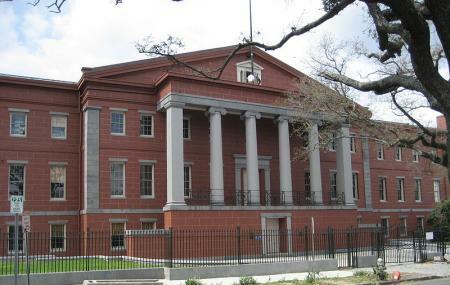 The Old U.S. Mint houses the Jazz Museum apt to explore when in the birthplace of Jazz music. The collection of the museum includes Louis Armstrong’s first cornet, Edward “Kid” Ory’s trombone, George Lewis’ clarinet, Sidney Bechet’s soprano saxophone and Warren “Baby” Dodds’ drum kit among other items. Other highlights include rare performance costumes, original photographs and manuscripts, historic recordings and rare film footage. If you love Jazz music, don’t miss out on this place when in the city. Love this? Explore the entire list of places to visit in New Orleans before you plan your trip. Fancy a good night's sleep after a tiring day? Check out where to stay in New Orleans and book an accommodation of your choice. How popular is The Old U . S Mint? People normally club together St. Augustine Church and The Outlet Collection At Riverwalk while planning their visit to The Old U . S Mint. Not big but some great features. Louis Armstrong's first cornet on display. Great room dedicated to drumming in New Orleans history. A whole room dedicated to Prof Longhair.. fascinating. Also interesting venue in the Old Mint building with exhibition. Only $6 for a real piece of jazz and NOLA history. This jazz museum was pretty alright. The temperature thought the building was very odd, constantly having to take on and off my jacket. The actual exhibits were pretty cool. But the place had an overall kind of weird vibe to it. Plus some of the audio listening machines were very odd and not even working sometimes. Could be improvements. This is a very nice place to visit! They’ll at times have events set up outside as well. I recommend stopping by here if you’re touring New Orleans or if you live here and are looking for something to do! It is really an embarrassment to the state of Louisiana and the City of New Orleans to leave this museum in the way it is now. Most of the exhibition were closed and the open one has nothing to offer, except of some pictures and couple instruments. It was a disappointment to me and my family visiting this museum. What the museum offering is almost close to nothing compare to the rich history of Jazz. I think the City of New Orleans should invest little bit more on this museum other wise it's a shame to ignore such a beautiful part of the city culture and the amazing music.